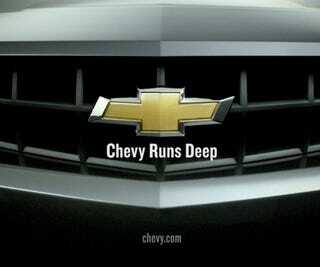 We've really tried to not hit the easy joke from the bowtie brand's new tagline "Chevy Runs Deep." But when it's stuck on the tip of a phallic Camaro thrusting out in these new ads, how can anyone avoid it? And what happens when your Amerigasmic love for Chevy runs so deep its seeds find purchase in the crucible of life? Babies! Cute, all-American babies! Who doesn't love babies? The truck version of this ad uses the same visual style, but switches babies for dogs, and the end line is: "A dog and a Chevy. What else do you need?" First off, isn't that a question advertising is supposed to answer? Secondly, the only spectacle that could try to pull more heart strings than these ads would involve Andrea Bocelli singing a live score to the movie "Beaches" in an auditorium filled with Precious Moments figurines as painted by Thomas Kincade. What makes this all so strange is that the ad for the Volt from the same group of people has none of these flaws. It actually sells not just the car, but the engineering that made it possible. Which plays up the real problem: Chevy is trying to relaunch itself while a little low on new models. North of the well-done Cruze, the car line is aging (Malibu) to aged (Impala). The Equinox is a hit, and the Traverse does well, but the truck line has suffered from the bankruptcy-reduced spending on new models. Hence the attention given to the Volt, an important car that, even if it meets all its targets, will sell in smaller numbers than the Corvette next year and every other Chevy model. Next time, use less cute and more metal, please.